Review: The Crisis of Christendom by Warren H. Carroll | Quidquid Est, Est! This is something new for Quidquid Est, Est. Book Reviews. As mentioned, I will be reviewing books, some old and some new, that might be of interest for readers of this blog. They will have their own special category and will be (generally speaking) unrelated to other posts prior to or succeeding them. And it is my honor to review, for the inaugural Book Review, a work that I have been awaiting probably more than any other person on Earth. 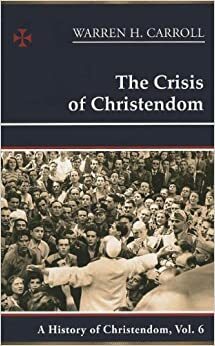 The book is the sixth volume in the late Warren H. Carroll’s History of Christendom series, The Crisis of Christendom (published this year by Christendom Press). To give you an idea of how long the wait has been for this particular volume, the fifth book of the series, The Revolution Against Christendom, came out in 2005. 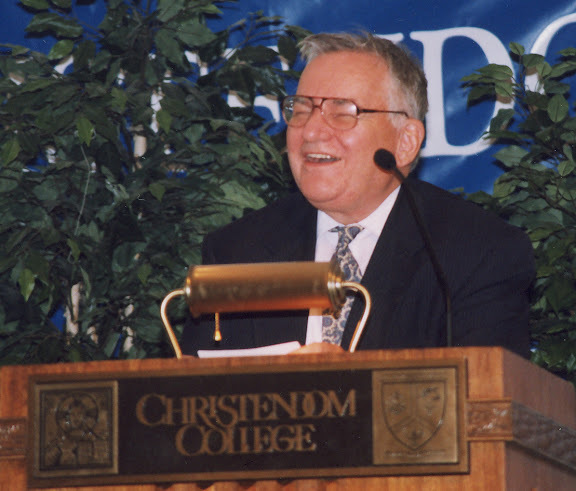 The author, an esteemed Catholic historian known worldwide for his devout recounting of key events in Christian history and his role as founder and first president of Christendom College in Front Royal, Virginia (my alma mater), died in 2011. At the time of his death, news releases from ChristendomCollege assured fans of the series that the volume was near completion, and that its publication would be in June 2012. June 2012 came and went, and it seemed for a year the publication date of the book pushed forward a month at a time. I was going crazy. But I have it now (it came out in July 2013), and have read it, and can say with confidence that it was well worth the wait. The book contains a Forward written by Carroll’s widow, Anne Carroll, who is the co-author of the last two volumes of Carroll’s history. She notes that the volume covers the years between 1815 and 2010, a time of immense historical events. Mrs. Carroll notes, “It is not possible to cover these years with the thoroughness of most of his [Warren Carroll’s] earlier volumes. But Dr. Carroll had selected the topics he wanted to cover, out of all the events that could have been discussed, and it is those topics that are presented here” (p. ix). As a result, the structure of this volume differs from earlier volumes. Whereas the chapters in Volumes I-V covered several events within a set time frame, often switching from one topic to another without clear delineation, Volume VI includes subtopic headings, helping the reader know the main focus of that section. It is a welcome addition which adds to the book’s value as a reference text. Volume VI opens where Volume V closed, in Europe following the final defeat of Napoleon Bonaparte. It traces the historical attempts to reunite and restore a broken Europe from the ashes of Napoleonic conquest. The major historical players are discussed, kings and queens from throughout Europe. Carroll then discusses the seeds of a new revolution in the writings of Karl Marx. Later chapters in the volume will examine in great detail one of Carroll’s favorite historical topics: Communism. The birth of Communism is documented, and rightly so. Carroll, however, does not leave the story dark, for great light shone in Europe during the 19th century, namely visitations of Mary (during what Carroll calls the “Marian Century”), the pontificate of Bl. Pope Pius IX, and the climactic meetings of the First Vatican Council. Also discussed are the trials and victories of the New World, especially in the United States of America. Carroll devotes an entire chapter to the abolition of slavery in the USA, including a brief examination of the American Civil War (1861-1865). Carroll also devotes space to examining the results of the Industrial Revolution in America and Europe, deflating the belief in a “Gilded Age” in late 19th-century America. Then the story of Christendom turns dark again. The chapter appropriately entitled “The Ditches of Death” recounts the horrors of World War I, while several chapters (from “The Ultimate Revolution” through “The Last Crusade”) recount the takeover of Communism in Russia and throughout Eastern Europe, the spread of eugenics in Europe and America, and the beginnings of Fascism in Germany and Italy. The main focus of Volume VI is the evils of these totalitarian governments, the history-makers who guided those evils, and those brave men and women who fought valiantly against them. Carroll adapts much of the material dealing with the 20th century from three of his earlier works: his first book, 1917: Red Banner, White Mantle; his book-length study of the Spanish Civil War, The Last Crusade; and his monumental work, The Rise and Fall of the Communist Revolution, which presents a penetrating investigation of international Communism from its beginnings to its fall in the early 1990s. This current Volume borrows heavily from those works. Many of the same players appear here. Vladimir Lenin, Adolf Hitler, Joseph Stalin, Mao Zedong, and Pol Pot appear as mankind’s enemies, those who made the world-wide revolution, villains worse than any Disney monster. Winston Churchill, Bl. Karl of Austria, Carl Gustaf Mannerheim, and Ronald Reagan stand as those who defied their totalitarian adversaries, heroes to their dying days. And as with all volumes of Carroll’s History, the popes play a central role in the fight for the Church. Already mentioned was Bl. Pope Pius IX. His successors Leo XIII, St. Pius X, Benedict XV, Pius XII, Bl. John XXIII, Paul VI, and Bl. John Paul II each play an important part in the history of Christendom. The key to interpreting the course of the 20th century, Carroll holds, is a vision granted to Pope Leo XIII. In the vision, God allowed Satan to unleash his worst upon the world for one century, a century which Satan could claim as his own. The vision went on to show that Satan chose the 20th century as his century. Carroll uses this vision as a constant refrain throughout this Volume to help explain how men committed the evils that occurred during the past century. The heroic popes mentioned above all stood against such evil. Carroll also includes the stories of heroic saints, especially martyrs who stood against the evils of Communism and Fascism and the holy visionaries of Mary. Saints form an essential part of any study of Catholic history, as Carroll notes in one of the appendices to the Volume. Also featured is a detailed chapter on the Second Vatican Council and the heresy of Modernism, both of which are greatly misunderstood in the Church today. Carroll concludes the book with a chapter devoted to the dignity of the human person, a fitting end as both Communism and Fascism attacked this dignity, as did all socially abusive movements in the 20th century, such as the anti-worker laws, the eugenics movement, and, of course, the abortion movement. There is no happy conclusion to this Volume, as much work is needed in the fight to save Christendom. Carroll hoped that, in the words of his widow, “each reader of this volume would work to build the culture of life in whatever sphere he can” (p. xi). This Volume features something unique in the canon of Warren H. Carroll works: Appendices. There are four appendices at the end of this book, each one echoing, in a sense, Carroll’s hope for this Volume. The first, “Mission,” is an autobiographical memoir discussing Carroll’s life prior to his founding ChristendomCollege, in particular his education and his conversion to the Catholic Faith. It is enlightening because it provides readers with an introspective look as to how God worked in Carroll’s life to bring him home, in particular the role his wife Anne played in his conversion. It is also a brief first-hand account of some key moments in 20th century intellectual and cultural history, such as the conservative movement in the mid-20th century and the work of Triumph magazine (a late-20th century Catholic magazine that had a major impact on Carroll and other Catholic intellectuals during that era). The second, “Principles for Writing Catholic History,” provides six principles for Catholic historians writing today. Most are logical: ‘Accepting and Hailing the Supernatural’ (a favorite topic of Carroll’s, as noted in this essay), ‘Seeing All History as Religious and/or Political’ (again, a favorite position of Carroll’s is that history is made by men and women, not social/economic forces), ‘Acknowledging that the Popes Act in History’ (not only that, but the biographies of popes are often good sources for contemporary historical research, especially the multi-volume histories of Horace Mann and Ludwig Von Pastor), ‘Seeing the Impact of the Saints’ (holiness attracts, as one professor of mine would say, and thus holy people have an important historical impact), ‘Eliminating Bias’ (historians should not always write history like hagiography), and ‘The Legacy of Triumph Magazine’ (which Carroll, a former contributor to the magazine, says holds that “the teachings of the Catholic Church alone can explain modern history and culture” [p. 822]). The third appendix is “Having Done All, To Stand: The Epic of Malta,” a printed version of a lecture Carroll had given at ChristendomCollege several years ago (I was there; it was my first time meeting him). The essay chronicles the island of Malta’s stand against Turks, Napoleon, and Hitler. There is passion in Carroll’s chronicle of Malta’s epic history, a passion rarely seen in historical works today. The fourth appendix is the most unique, an unfinished poem of Carroll’s entitled “The Ballad of the Reconquista: Pelayo at Covadonga.” It is an epic-style poem reminiscent of G. K. Chesterton’s The Ballad of the White Horse. Here is another way of teaching history, one ancient, yet ever new: through poetry. I had never read or heard Carroll’s poetry before; after reading this incomplete poem, I wish there was more of it. The feature of the Volume that struck me the most was how personal Carroll made it. Other volumes in the series provide digressions and comments by Carroll in the footnotes of the work, though these comments are usually in the third person (i.e., “the author’s work”) rather than first person (i.e., “my work”). In Volume VI, not only are references to Carroll’s previous works referred to as “my/mine,” but other comments by Carroll in the text of the history, not in the footnotes, are in first person. This gives the reflections a more personal aspect, as if Carroll is speaking directly to readers about something close to his heart. It is good to hear from him again. Above all, this is a labor of love, the result of over thirty years of historical study and research, the fruit of a lifetime of conversion and conversation. This is more than a volume of history. It is more than the story of men and women in the “accursed twentieth century,” as Carroll refers to the past century. It is Carroll’s final work, and it is his lasting literary legacy. The Crisis of Christendom is available from Christendom Press and from Amazon. Press Release from Christendom College concerning the book’s publication. A short biography of Carroll from the Christendom College website. You are right in noting that many good books on Church history are in French. Perhaps the most encompassing of these French histories is the one by Henri Daniel-Rops, which is in even more volumes than Dr. Carroll’s. It was translated into English in the 1940s and 50s, I believe. Daniel-Rops’s history, however, is not as scholarly as Carroll’s, though his prose is fantastic. Unfortunately, I cannot read French (I took Latin in high school and college, not French), so I can’t review the books you mentioned. I would be happy to if an English translation existed. Americanism has always interested me. I know there are a few books about it, but they were written in the early part of the 20th century. You are right in that one can see in Americanism the seeds of the modernist errors to plague the Church during the late 19th and early 20th century, as well as the issues that face the Church today, especially here in America. I would not agree with your statement about “Vatican II and the destruction of the Mass.” I feel that a closer examination of the documents of Vatican II and its interpretation under Pope St. John Paul II and Pope Emeritus Benedict XVI are key to appreciating this Council. Of course people misinterpret the council and what it said, or flat out ignored it. Practically every council in Church history has its dissenters and protesters. Both “ultra-traditionalists” and “liberal” Catholics are like this, in that they have both missed the point of the Council. One has condemned it as a break with Tradition, the other has embraced it as a break with Tradition. Both are wrong. Dr. Carroll’s book reviewed here examines the Church during the 20th century, devoting an entire chapter to the Second Vatican Council. It cites a very important history of the Council, The Rhine Flows into the Tiber by Fr. Ralph Witgen.